After creating new soundtracks for “The Last Days of Pompeii”, “The Cabinet of Dr. Caligari” and “Inferno” the four composers of Edison Studio with Ivo Nilsson (trombone) and Daniele Roccato (double bass) present the score for Alfred Hitchcock’s 1929 film “Blackmail”. Alfred Hitchcock made two versions of “Blackmail” so it has the exceptional credentials of being both his last silent movie and the first all-British “talkie” to be provided with a complete soundtrack. Filled with tension and a growing sense of anxiety that affects all of the protagonists, the film shows that at 29 years of age Hitchcock was already a fully mature director. For the first time in his oeuvre at the centre of the story there is an innocent man who is wrongly suspected, but there is also the inner drama of a guilty woman and her boyfriend who, from his role as a detective and investigator, becomes an accessory to her crime, due to his love for her. Some scenes anticipate themes that would become particularly dear to Hitchcock, such as the final and climactic chase in a monumental building. 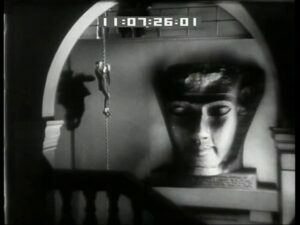 The film is also celebrated for its numerous technical innovations, such as the Schüfftan process, used for the scenes in the British Museum, or the lip-synching of Anny Ondra directly on the set. Enthusiastically received by audiences and critics at the London premiere of November 25th 1929, “Blackmail” confirmed Hitchcock in his position as the most important English filmmaker of his time. The composition of the soundtrack was preceded by a long phase of segmentation, analysis and interpretation of the film and its portrayal of the characters. The sound environments were established, as well as the expressive atmospheres, the kind of support to be used for the tracks and finally the kind of sound materials that would be used. The timbric palette of the score includes instrumental and vocal samples, concrete and synthesized sounds, pre-existing musical fragments, and finally, brief quotations from subsequent Hitchcock soundtracks, inserted as significant sound icons with a particular resonance. The score played by the four composers of Edison Studio has all the immediacy and excitement of a live musical performance, in the best traditions of the silent film. The instrumentation includes a computer, MIDI keyboards and samplers, acoustic instruments (also with two miniature violins), as well as percussion and various resonant objects. All of the sophisticated technology that is available to us today is combined and overlapped to create the soundtrack for a movie that was also very technologically advanced and experimental for its time.